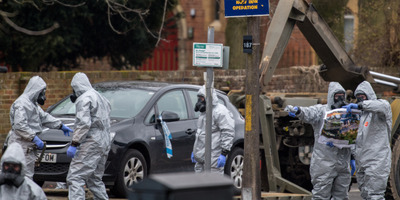 Chris J Ratcliffe/Getty ImagesMilitary personnel wearing protective suits remove a police car and other vehicles from a public car park as they continue investigations into the poisoning of Sergei Skripal on March 11, 2018 in Salisbury, England. French authorities are taking a second look into the death of Alexander Perepilichnyy and investigating it as a murder investigation. Perepilichnyy mysteriously died while jogging outside of his home in England hours after returning from a four-day visit in Paris. He was a central witness in a key corruption case before he died. French police are taking another look at the mysterious 2012 death of a Russian businessman, treating it as a possible “assassination,” according to the Globe and Mail. The renewed investigation comes after the March 4 poisoning of Sergei Skripal and his daughter, the Globe and Mail reports, and is one of 14 similarly mysterious deaths of Russian exiles in the UK that are being revisited. The businessman in question, Alexander Perepilichnyy, made his fortune by investing money that had shady origins into other ventures. One of his biggest partners was Vladlen Stepanov, who was married to a government official in charge of a Moscow tax collection office. Perepilichnyy reportedly became a money launderer for Russian organised crime, and when his benefactors began to suspect him of theft, he fled to the UK and helped Bill Browder prove the massive corruption that Russian lawyer Sergei Magnitsky had been killed trying to investigate. Perepilichnyy provided evidence that he handled some of the $US230 million stolen from Russian tax rebates, and funneled them through bank accounts and shell companies. The US would pass the Magnitsky Act in 2012, which sanctioned 18 Russian individuals, froze any assets they had in US banks, and prevented them from using the US banking system in the future. In 2016, it was expanded to include 44 individuals worldwide. The Magnitsky Act has been a thorn for Russia, and President Vladimir Putin has pushed for its repeal. But Perepilichnyy did not get to celebrate its passage. He died while jogging outside his home in Surrey, England, hours after he returned from a four day trip to Paris. “The British coroner’s inquest has heard that Mr. Perepilichnyy died with a rare and toxic herb – believed to be gelsemium, which grows only in Asia and is called ‘heartbreak grass’ because ingesting it can trigger a heart attack – in his stomach,” according to the Globe and Mail. British authorities have said that they do not believe Perepilichnyy was murdered, and have declined to pursue the case further. But Kremlin sceptics believe that Perepilichnyy, like Skripal, was targeted by Russian authorities, or at least someone he had betrayed. “Perepilichnyy turned against his people. He was as important a traitor as Skripal was,” Browder told the Globe and Mail. Browder said that French police have interviewed him, and the Globe and Mail reports that the prosecutors in Paris are looking into a “criminal conspiracy and assassination” case.